Ahead of the Club Monaco Fall 2017 collection previewed this morning on the 71st floor of the World Trade Center, we caught up with Head of Design – Mens & Womens, Steven Cateron to check out the latest collection inspiration and to find out a bit more about the newly appointed head of Design for Women’s whom was previously just the brands head of Menswear . Images previewed are from the Fall 2017 presentation at New York Fashion Week. Some looks can be purchased online in a see now buy now capacity on clubmonaco.com. CT: Can you tell us more about the Fall 2017 Women’s presentation we’ve just seen? SC: The Fall Collection was inspired by the ever-evolving notion of the modern woman. We really wanted to celebrate women of diverse minds, priorities and passions who embrace the opportunity to start again and create a world of their own making. CT: How do you think your past experiences have influenced your vision at since being at Club Monaco? SC: I was born and raised in Los Angeles and grew up sewing and dreaming of a future in fashion. I was always interested in fashion design and history and immersed myself in vintage. Can you describe the Club Monaco girl in three words? CT: Who would you say the global core consumer is for Club Monaco and what does she like? SC: Club Monaco is a brand for individuals and their unique lives, so when I think about ‘the Club Monaco woman’, I don’t envision just one woman, but many. She is multifaceted. She knows who she is and isn’t looking for confirmation of her identity. At the same time, she is also inquisitive and curious, open to new experiences and eager to explore the world around her. She is looking for pieces that showcase her individual style, but don’t overpower her. 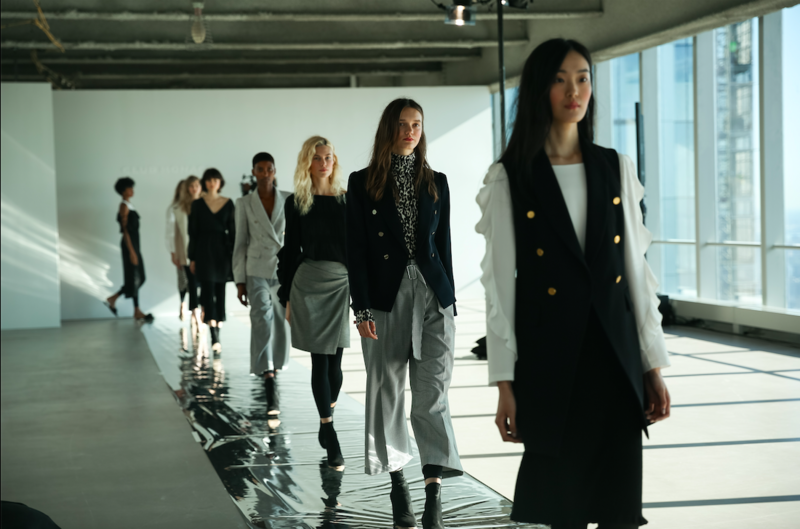 CT: How do you and the team forecast the season ahead keeping the Club Monaco girl in mind? SC: As a designer, it’s important for me to create a strong connection with our customers and their lives and needs as they evolve and change. First and foremost, we design with our customers in mind, reinterpreting of-the-moment details in a Club Monaco way that allow her to seamlessly fit these pieces into her wardrobe. CT:What would you say the three top investment pieces are from Club Monaco that every woman should invest in? SC: I believe every woman should have a great Blazer like Club Monaco’s Jowdie Blazer, or the Christobelle Pant giving a strong nod to menswear yet with a feminine cut. CT: How would you best describe yourself and your aesthetic? SC: Classic and effortless, never too fussy. CT: What is next for Club Monaco? SC: We will continue to work tirelessly to create pieces that are purposeful, impeccably fit, and made with the best fabrics. We are constantly revisiting archival Club Monaco designs, mixing materials and reworking shapes to reinvent Club Monaco essentials and develop our customers’ wardrobes. SC: What do you think of British Fashion? CT: There are always cool kids doing cool things! Images in this post are from BFA. This entry was posted in Interviews, New York and tagged Club monaco, Fall 2017, Interview, nyfw, Steven Cateron. Bookmark the permalink.